Below are some of the units and open sites that are available at this time. Some of the units I have more information then others. You should contact the owners of the RV for more info and to negotiate the terms of the sale. 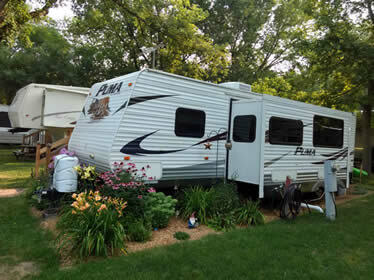 The sale of the RV includes the option to remain at it's current location at Shady Rest. However, for the unit to remain on the site, the new owners must be approved by the management of Shady Rest. Contact Ron or Eleanor Langhoff at 320-554-3777 for more details. We have 70 seasonal RV sites and 16 mobile home sites. Each site has water, sewer and electric. Rates include water, sewer, and winter storage at the site. All sites have 50 amp service, all are metered. 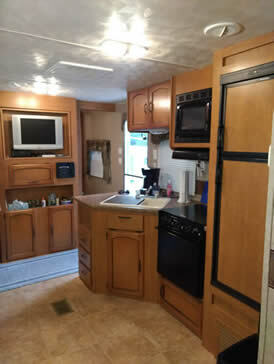 Lots are leased to the owner of the RV or mobile home, 1 family only. Family includes husband, wife and unmarried children under 19 years of age. ALL others are conside visitors or guests and must be registered and charged separately. The visitor fee is $5 per day, overnight stay is $10. We do not allow anyone else to use your RV while at Shady Rest Resort unless there is prior approval...they will be charged a camping fee. 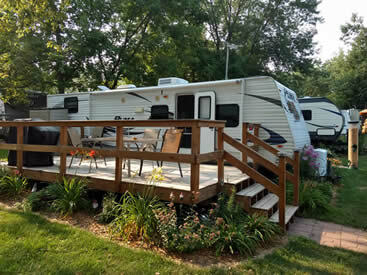 The seasonal sites have the same policies as the over night RV sites. We do not allow pets, jet skis, atv's, fireworks. We have a limited number of boat slips and they are in high demand...may be a waiting list, call for details. Occasionally we have Rvs that go for sale on a lot at the resort. The sale is negociated with the RV owner. The owners of Shady Rest Resort MUST talk to the potential buyers before the sale is allowed in order for the buyers to fully understand the rules and policies of the Resort. The RV can remain on the exsisting site and a new lease agreement must be signed by the new owner. The sale of the RV does not include the purchase or ownership of the lot that the RV is on. Shady Rest Resort and it's owners are not responsible for any inaccuracies in the descriptions or details of the RVs posted for sale on this site. 2005 Breckinridge Park Trailer, 36'. It has 2 slideouts, a deck, storage shed, storage box, grill, lawn mower, and is nicely landscaped. It sits on RV site #8 which is close to the lake. Please call for more details. Home: 763-786-3223 or Cell: 763-350-8149. 2010 Puma 30' camper. Model FQSS, that includes bunks. It has a large deck, storage shed, and is nicely landscaped. Located on RV site #22. All info provided subject to change and is as reliable as possible.